On October 19, 1829, in the far north of Russia, a weak and sickly child, named John (Ioann), was born in the family of Ilia Sergiyev, church reader in the village of Sura in the Archangelsk province. This child was the future luminary of Christ’s Church. From his earliest years Vanya went with his father to their poor and humble church, served in the altar, loved the service books, became very pious. His favorite book was the Holy Gospel. All of this became a firm religious foundation for the boy in his later long and glorious life in Christ. Learning came very hard to Vanya in his childhood, which sorrowed him greatly, but also served to spur him on to especially fervent prayers to God for help. And a miracle occurred! Once, during his sojourn in his religious school, after a fervent prayer during the night, the boy experienced a sudden shiver all over his body, and it was as though a curtain fell from his eyes, as though his mental sight opened up, and he experienced lightness and joy in his soul. After that night the boy immediately began reading with great ease, began to comprehend and memorize everything with the greatest facility. 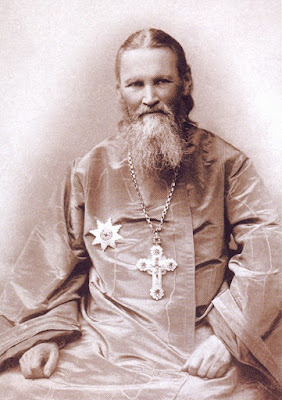 He finished his school at the top of his class, graduated from the Archangelsk Seminary in first place, and entered the St. Petersburg Religious Academy. His spiritual development proceeded even more successfully. In the academy St. John dreamed of missionary work among the native tribes of North America and Siberia; however, observation showed that the residents of St. Petersburg did not know Christ any better than the aborigines of other countries. While pondering his aspirations, St. John repeatedly saw a childhood vision: he saw himself as a priest in a certain cathedral and accepted it as a sign from above. 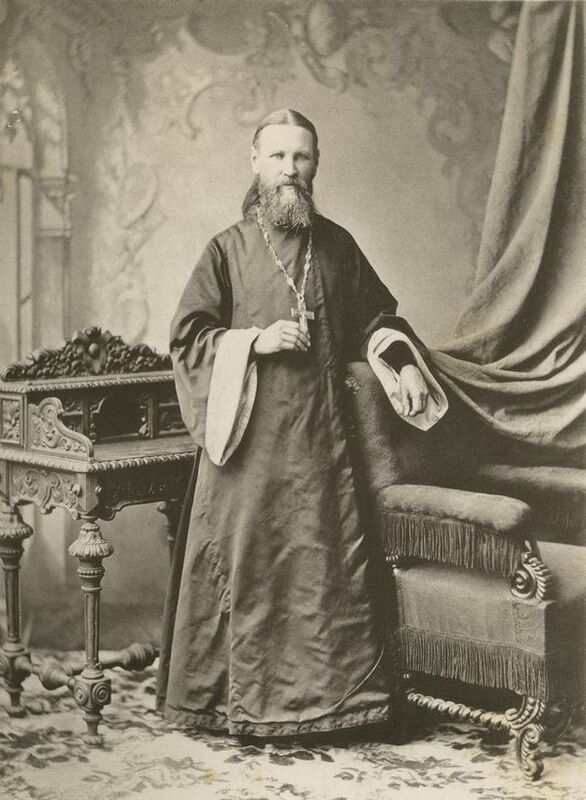 After graduating from the academy in 1855, St. John was ordained a priest. Upon first entering the St. Andrew Cathedral in Kronstadt, to which he had been assigned, he stood stock-still on the threshold: this was the very church that had been revealed to him many years before in his childhood vision! 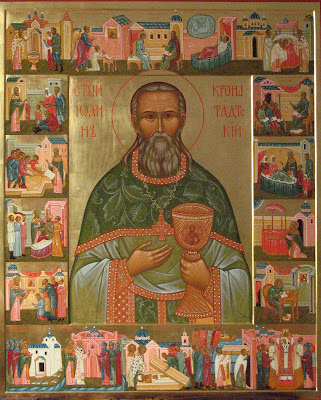 St. John spent the rest of his life and pastoral activity in Kronstadt. Many people even forgot St. John’s surname (Sergiyev), and even he himself signed as John of Kronstadt. After graduating from the academy, St. John wrote in his diary: “I’ve learned a great deal. Glory to Thee, O Lord! But I wish to know more. My spirit thirsts for knowledge. My heart is not satisfied, not sated. I am studying and will continue to study,” Stepping onto the path of independent life with such sentiments, the young pastor continued his book learning with great zeal. But already from the very first days of his priesthood St. John began his spiritual labor of engaging in charitable deeds of love, deliberately keeping them secret. Although afterwards he would say that he was not leading an ascetic life, these words were spoken by him out of deep humility. In reality, while concealing from people his spiritual feats, St. John was the greatest ascetic, and he began implementing the knowledge of conquering the self from the first days of his priesthood. Prayer and fasting constituted the foundation of his spiritual labors, as well as abstinence, and that not only in food, but also in all emotions. The daily serving of the liturgy alone, which St. John took on as a rule, required extensive fasting according to Orthodox church rule. However, St. John did not limit himself to daily services, constant prayer at all times and in all places, divine contemplation, fasting, and abstinence. From his first days as a priest he dedicated himself to serving the poor and the destitute, always sought them out and found them, helped them, took care of the ill, comforted those in despair, bringing to all not only the words of Christ, but also His living love and light. “There are many happy families without us, Liza. Let us dedicate ourselves to serving God,” – St. John, virginal to the end of his days, would say to his wife Elizabeth. Such was the faith in Christ and the love with which St. John burned from day to day, from year to year, without a single thought for human glory and other worldly vanity, preaching the light yoke of Christ to hard-working and burdened people, abnegating his own self, wearing himself out with fasting and prayer, drawing upon himself hostility and aggravation from envious and hardhearted people. In addition, St. John was a wonderful preacher. He set himself the rule of reading a sermon at every service. He did not seek eloquence, but spoke simply and often without any special preparation. His sermons had a strong effect on the common people. In reading these sermons in print, one is struck by their depth of thought, extraordinary theological learning, and simplicity and power of each word. All thoughts, all deeds, each minute of his life were committed by St. John to the glory of God, so that it was not surprising that his sermons were endowed with the strength of Christ. 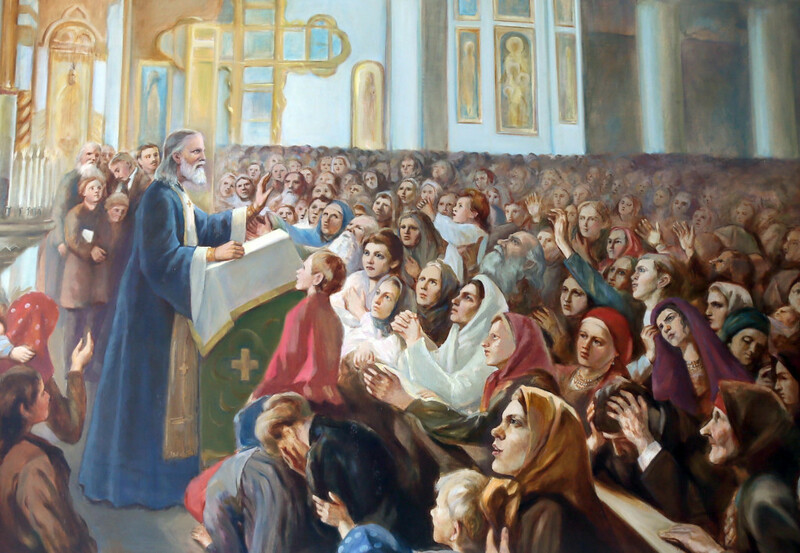 Thus through St. John – through his prayers and fasting, through his love-filled deeds, and through his inspired words – the light of Christ illuminated the embittered and wretched Russian people. In turn, these wretched people were the first witnesses of his miraculous healings. 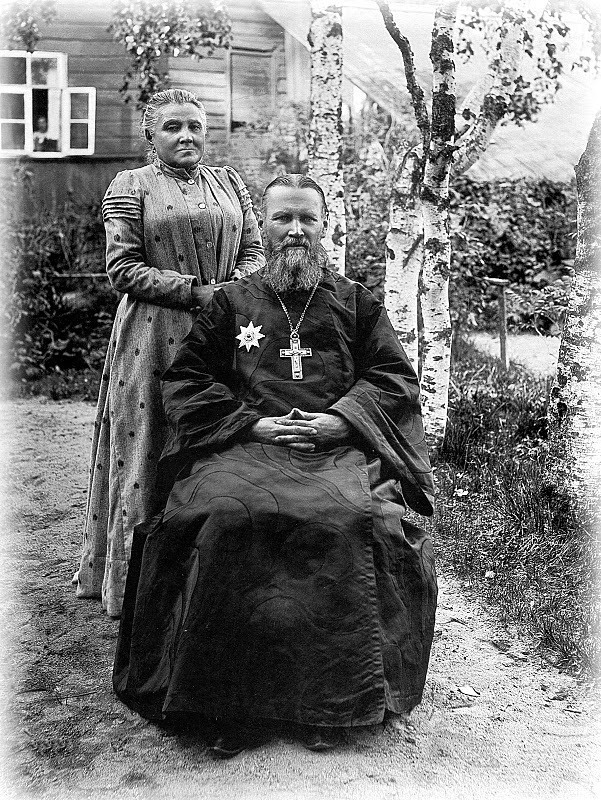 The vagrants of Kronstadt were the first to discover St. John’s holiness, but his discovery soon spread all over Russia with the assistance of the righteous Paraskeva, who had been sent to serve God’s servant St. John, who was still hidden from the world at that time. From the lives of the saints we know that the gift of miracle-working was given by God to His saints as a reward for their great labors, their prayerful endeavors, their fasting, deeds of love, compassion. We have seen that each day in the life of St. John was a day of great spiritual labor. And for this the Lord Jesus Christ, Whom he served so faithfully and zealously, glorified him. St. John spent almost 25 years in his spiritual labors known only to the common people of the city of Kronstadt and partially St. Petersburg. He performed his labor of love and his service to the Heavenly King with humility and meekness. And it was not he, the ascetic who had given up the world and his own self, who needed glory. “Not to us, not to us, Lord, but to Thy name give glory.” By God’s special providence and through the previously-mentioned righteous Paraskeva the glorification of St. John and the revelation of Christ’s luminary to all of Russia took place. 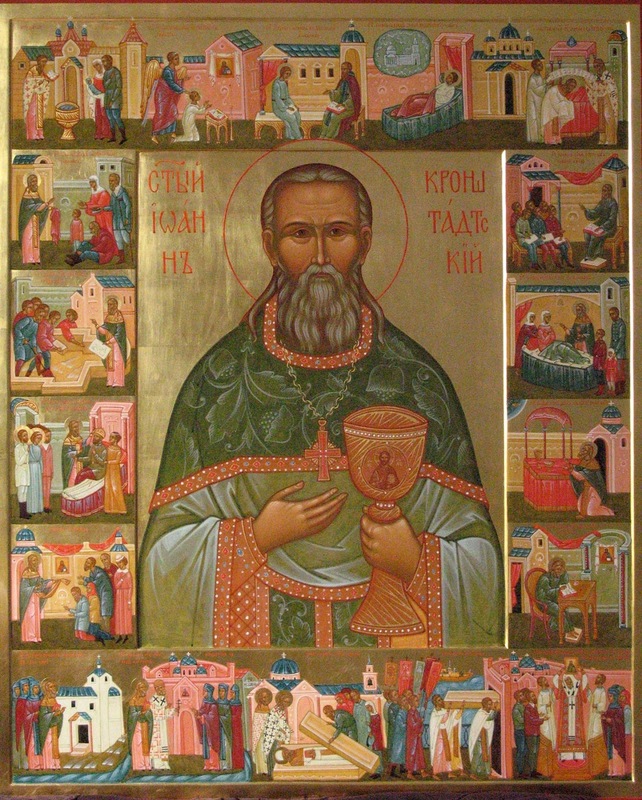 The Lord appointed St. John to be not only the pastor of Kronstadt, but of all of Russia. The entire believing part of Russia streamed to the miracle-worker. This glory, which to many seemed enviable, was a new and very onerous burden for St. John. Formerly, he himself used to go out to people solely within the bounds of his city. Some small freedom of movement and unrestricted time remained. Thus, for over 20 years St. John taught the Law of God in the city schools. Now even this small iota of freedom disappeared. 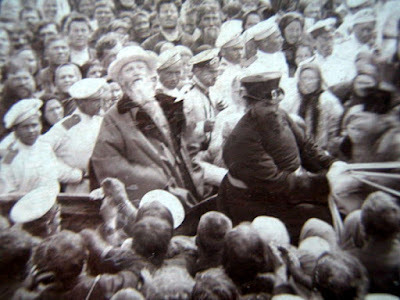 Thousands of people from all ends of Russia daily arrived in Kronstadt, seeking help from St. John; he received an even greater number of letters and telegrams. It was physically impossible for one person to cope with such a number of requests; the need arose for having secretaries, the teaching of the Law of God had to be ceased, necessity dictated the institution of general confession as a rule and private ones as an exception. In this manner the second part of St. John’s life and pastoral activity outwardly differed considerably from the first. Let us look closely at how St. John now spent his time, in order to understand the burden and the majesty of his spiritual labor. St. John got up at 3 A.M. and prepared for serving the matins in the cathedral. For a brief while he took a turn around the garden of his parish house, praying silently. Around 4 A.M. he went off to the cathedral. At the gates of his house he was met by a waiting crowd of pilgrims. He could speak individually with only a few of them. The majority were content to just receive his blessing, kiss the hand of the miracle-worker, touch his garments, catch his luminous gaze. At the cathedral St. John was met by hundreds of local beggars, to whom he gave charity according to established custom. At 4:00 began the matins, which St. John served without curtailing a single hymn and read all the canons himself. Before the beginning of the liturgy there was confession. Afterwards, without leaving the church, St. John began to serve the liturgy. The cathedral, which could hold up to 5,000 people, was usually full of the faithful, so that communion took a long time, and the liturgy never ended before 12 noon. During the service letters and telegrams were brought to St. John straight into the altar, and he immediately read them and prayed over them. 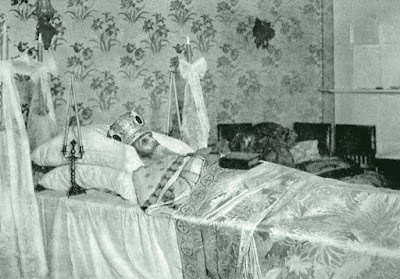 After the service, surrounded by thousands of the faithful, St. John left the cathedral and went to St. Petersburg in response to summons from countless numbers of sick people, from whom he returned home not earlier than 12 midnight, sometimes catching an hour of sleep on the train. And at 3 A.M. he got up again. Many nights St. John did not go to sleep at all (he prayed instead), yet no one ever saw him tired or drowsy. If we think carefully about the manner of life that was led by St. John, we will readily understand that only by God’s miracle could one live and work thus for decades. Such a life and such labors were above human powers; they were supernatural. Only earthly angels and celestial humans, as it is said of saints, can live like that. In spite of being so busy, St. John found time to keep a spiritual diary, wherein he recorded on a daily basis all the thoughts that came to him during prayer and contemplation, as a result of the grace-filled illumination of his soul by the Holy Spirit. These thoughts filled up an entire wonderful book, published under the title “My Life in Christ.” This book represents a true spiritual treasure-trove and will for all ages remain a witness to how the great saint lived and how should live all those who wish not only to be called, but actually be, Christians. The basic idea of all of St. John’s writings is the need to have sincere and ardent faith in God and to live according to faith, the need for constant battle against passions and vices, and the need to be loyal to the faith and the Orthodox Church as the only source of salvation. 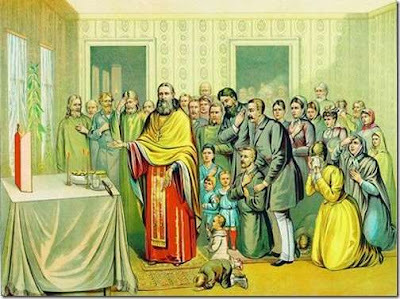 For his native land Russia St. John was like a thundering prophet of God – preaching truth, denouncing lies, summoning to repentance, and forecasting God’s imminent vengeance for sin and apostasy. Being himself an image of meekness and humility, love for every person, irrespective of nationality or religion, St. John adopted an attitude of great indignation towards those godless, materialistic, and liberal trends, which subverted the faith of the Russian people and sabotaged Russia’s thousand-year-old government. Subsequent events of the bloody Russian Revolution and the triumph of the godless and inhumane Bolshevism showed how right was the great saint of the Russian land in his warnings and prophetic visions. Together with glory and honor, large sums of money flowed to St. John for the purpose of charity. The amounts of these monetary sums may be judged only approximately, since St. John immediately gave everything away. Only postal receipts were recorded. According to people close to St. John, a good million rubles a year passed through his hands. He took in with one hand and gave out with the other. There were cases like the following: once, in the midst of a huge crowd, St. John received a packet from a merchant’s hands and without opening it, immediately passed it into an outstretched hand of a beggar. The merchant became agitated: “Batyushka, there are a thousand rubles there!” – “His luck,” calmly replied St. John. Sometimes, however, he refused to accept donations from certain people. There is the well-known case where he did not accept 30,000 rubles from a wealthy widow. This case was a prime example of St. John’s clairvoyance, since the woman had gotten this money in a tainted manner, for which she subsequently repented. St. John did a great many charitable deeds with these donations. He daily fed a thousand beggars. In Kronstadt he set up a House of Industry, comprising a school, a church, workshops, and an orphanage. In his native village he founded a convent and built a stone church, and in St. Petersburg, on Karpovka Street, he founded another convent (in which he was later buried). Having attained a high level of prayerful contemplation and impassivity, St. John calmly accepted and put on the rich vestments presented to him by his venerators, since these vestments were for the glory of God and not his own. Moreover, they even served to conceal his spiritual feats. But the donations he received he gave away to the very last penny. St. John reposed on December 20, 1908, having foretold the day of his death. Tens of thousands of people attended his funeral, and a multitude of miracles occurred at his tomb, both then and in the times that followed. His was a truly extraordinary funeral. Throughout the entire expanse from Kronstadt to Oranienbaum and from the Baltic train station in St. Petersburg to the St. John monastery one could see crowds of weeping people: “Batyushka, our batyushka, wherefore are you leaving us?” – desperately cried the common people. The people’s tears at the funeral were so bitter and sincere, that at times even the singers of the Pavlov Life-Guards regiment could not refrain from crying. The mournful ringing of the bells, the quiet flickering of the candles in the gathering darkness of the foggy St. Petersburg evening, the singing of the funereal canon, and the tears of the people – all merged into a majestic and mighty accord that will long not be forgotten by witnesses of this event. What does the life of St. John of Kronstadt teach us? Truly it was a great sign of the times, sent to Russia on the eve of its unimaginable catastrophe. In the person of St. John, as in a droplet of water, was reflected the sun of the great soul of the Russian people: unshakeable faith in Christ, simplicity, humility, meekness. St. John came from the common people and retained this simplicity of origin, simultaneously uniting with it a great mind and a wide array of knowledge. St. John was truly an image of the multi-million Russian people, a mirror reflecting the bright characteristics of Holy Russia. In him were merged and reflected the feelings of tsar and peasant, merchant and nobleman, rich man and beggar, – all those who embraced in their heart the commandments of Christ. 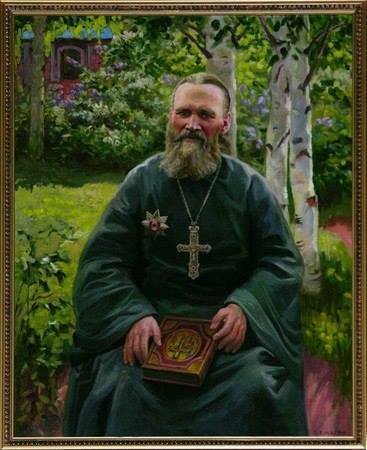 The righteous St. John of Kronstadt was canonized by the Russian Orthodox Church Abroad on November 1, 1964.